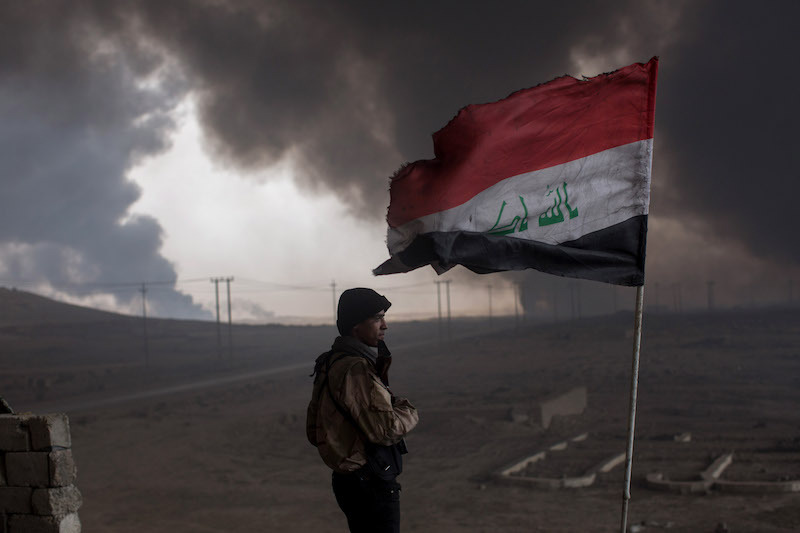 In October 2017, Iraqi forces captured the town of Hawija from the Islamic State, taking back one of the militant group’s last remaining strongholds. But now, ISIS has regrouped in the area and continues to terrorize residents. 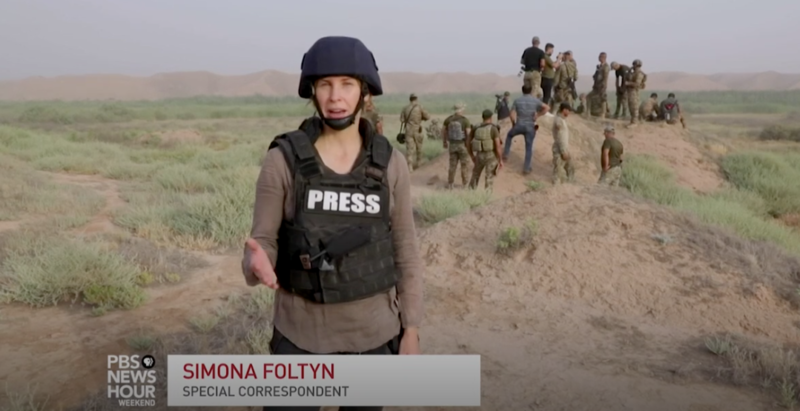 NewsHour Weekend Special Correspondent Simona Foltyn recently traveled near Hawija to find out how much control the militants continue to assert over the civilian population for this report in cooperation with the Investigative Fund at the Nation Institute. SIMONA FOLTYN: ISIS is making a comeback in Iraq and so far the government has failed to stop it. In my last report, I accompanied Iraqi Security Forces as they tried to clear remote, mountainous areas where ISIS militants have regrouped. These clean up operations were largely ineffective. The government troops known as the emergency response division were used to fighting a conventional war against ISIS. They struggled to adapt to ISIS' guerilla tactics. Despite days of security forces searching, the militants remained elusive. But just because the government can't find them doesn't mean that ISIS isn't there. To find out just how much control the militants have managed to assert over civilians, I travel to rural areas near the Sunni town of Hawija. Hawija was an ISIS stronghold for three years, and was one of the last towns security forces freed in october 2017. Soon after, the government declared victory over ISIS in Iraq. Much of Hawija was destroyed in the fighting, and is still abandoned. But people around here say ISIS was never defeated. Like many other civilians, this family spoke on the condition of anonymity. Less than a year after Hawija was retaken by the Iraqi Government, ISIS has regrouped and is terrorizing the population. To protect themselves and their families, local tribesmen have organized their own defense groups. Civilians say that with no real protection from the government, they have little choice but to comply with the terrorists' demands. CIVILIAN 1: The liberation was superficial. 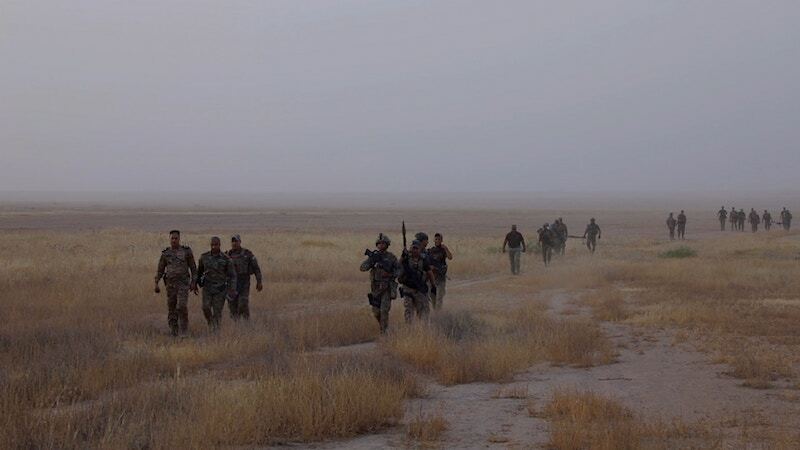 Security forces passed quickly through the villages. When the army entered, ISIS fled towards the mountains and the river banks. SIMONA FOLTYN: Now, less than a year after Hawija was retaken by the Iraqi Government, ISIS has regrouped and is terrorizing the population. CIVILIAN 2: They don't just come at night, even daytime, we are in danger of being kidnapped, killed, slaughtered, robbed. ISIS can do anything. We are under their control. SIMONA FOLTYN: Near this village, ISIS kidnapped and killed several people, including community leaders who were known to oppose them. The group posted these pictures on social media, showing the executions. CIVILIAN 2: If someone tries to speak or do anything against ISIS, your whole family will be in danger, whether it's during the day or night, they have no problem. SIMONA FOLTYN: To protect themselves and their families, local tribesmen have organized their own defense groups. This family's son, twenty-five-year-old son was one of them. His parents say he was killed in May while trying to repel an ISIS attack on his village. They are angry at the government and say it's not doing enough to protect the area. CIVILIAN 1: Where's the security? If they are so close to the village, if ISIS can come to this place? Take a look at Part 1 of our television series. SIMONA FOLTYN: Like many others we meet, this family claims that the Federal Police, one of the government security forces operating in the area, often don't respond to calls for help, especially at night. They say the police only show up to conduct weapons searches of the families themselves. CIVILIAN 1: When they find any weapon that hasn't been licensed, they confiscate it. But on the other hand, they say that the villagers must protect themselves with their own weapons. SIMONA FOLTYN: Civilians say encounters with ISIS have become a near daily occurrence in this area, but many are reluctant to speak openly about them for fear of being targeted by ISIS. As Sunnis, they also fear the Shia-dominated security forces, whom they blame for failing to secure the area. Just four days earlier, during late evening hours, this farmer says a group of 6-8 armed men detained him and four others while they were watering their crops. Like many other civilians, he spoke on condition of anonymity. ANONYMOUS MAN: They had surrounded me, I did not realize because I was bending down to the ground, then I heard the sound of a gun cocking. I was surrounded. Lift your hands, they said, so I lifted my hands. Old man, respect yourself. Respect your age. Do not force us to mistreat you. So I didn't say anything. I was a prisoner. SIMONA FOLTYN: The farmer suspects that the militants were ISIS. He says they asked if he or any of the other captives belonged to local security forces. Eventually, he and all but one of the detainees managed to escape after fellow villagers intervened. He says the government forces never showed up. ANONYMOUS MAN: The security forces never came. It was only the villagers who helped us. SIMONA FOLTYN: To contain any insurgency, cooperation from civilians is paramount. But mistrust runs deep here. While Sunni civilians accuse the Shia-led government of not doing enough to protect them, the government forces, in turn, accuse the civilians of supporting ISIS. LT. COL. MOHAMMED FLAYEH AL BEIDANI: It's very difficult to gather intelligence. The reason is the nature of this area. People have close family relations with ISIS, so that's why it's not easy to get information from them. SIMONA FOLTYN: The Federal Police say that many ISIS fighters managed to flee the battlefields last year. Commander Mohammed Flayeh al Beidani takes us to what he says is a former ISIS hideout his forces raided in early July. LT. COL. MOHAMMED FLAYEH AL BEIDANI: This is a shed where people normally keep their sheep. What raised suspicion was the existence of the air cooler and clean water. You know that in such a place, you shouldn't see this kind of stuff. This made us skeptical and we expected that there may be someone hiding there. SIMONA FOLTYN: The commander says four alleged ISIS militants were killed during the raid. The police also accused the residents of this house, located just behind the hideout, of aiding ISIS. LT. COL. MOHAMMED FLAYEH AL BEIDANI: They were arrested and transferred to the relevant authorities. Yes, because they were cooperating with ISIS. SIMONA FOLTYN: The Federal Police don't allow us to get closer to the house or film it. From a distance, it appears that the house has burned down in a fire. Civilians and tribal leaders say that security forces systematically destroy houses of suspected ISIS families and collaborators. When ISIS ruled this area from 2014 to 2017, some civilians did support the terror group, while those who opposed its rule or the group's strict interpretation of the Quran were often executed in public. Trying to tell innocent civilians from ISIS supporters is no easy process, and one that has further divided Iraqi society. Muntaha Fouad's son and husband joined ISIS. They surrendered when Iraqi forces liberated the area, and are currently imprisoned. Fouad herself, and the rest of her family, were accused of being ISIS collaborators by association, and were transferred to this camp an hour east of Hawija. But she insists that she has nothing to do with ISIS. MUNTAHA FUOAD: What is our guilt? I know nothing about my son, I know nothing about my husband. My son made mistakes and paid the price for that. He went and handed himself in to the authorities. What about us as women? It's not fair to be treated like this. SIMONA FOLTYN: The Iraqi Government forces families of ISIS suspects to stay in these closely guarded camps, claiming that a return to their villages would help ISIS to spread again. But camps or no camps for its alleged supporters, ISIS is re-establishing itself. And many civilians say that with no real protection from the government, they feel they have little choice but to comply with the terrorists' demands. We meet another farmer who says he has interacted with ISIS many times since their official defeat in 2017. First, he says, a militant, whom he recognized as a neighbor, began calling him on his phone. He says he reported the calls to an intelligence officer at the Federal Police, who instructed him to keep speaking to the militant and record the phone conversations to help the police gather intelligence. Then, he says, one day, the militant and six other ISIS members showed up in the farmer's backyard. ISIS: Yes, can you come? FARMER: Are you behind the river? FARMER: What should I bring with me, what do you need? ISIS: Bring us cold water and let's meet. SIMONA FOLTYN: The farmer says he immediately called his contact at the Federal Police. ANONYMOUS MAN: I knew that they are in my farm behind the river hiding, so I called the security forces, the intelligence, it was before sunrise. I told them ISIS are in my farm and they asked me for food. SIMONA FOLTYN: He says the intelligence officer instructed him to cooperate with the militants until security could arrive. He gave the militants food and water, he says, but to his surprise, the Federal Police turned on him when they arrived, accusing him of being an ISIS supporter and jailing him for a week. ANONYMOUS MAN: They hurt me, they beat me, they put me in prison. SIMONA FOLTYN: Such incidents have led people in Hawija to believe that ISIS has infiltrated the security forces. The farmer now lives in fear of both. ANONYMOUS MAN: I go back to my original home during the day just to feed the sheep, in order to take care of the farm. At night I stay at another house, but still I feel afraid. I fear for my family. I put my family in danger because I cooperated with the Iraqi army. SIMONA FOLTYN: Many civilians around Hawija have resigned themselves to once again living under ISIS. They no longer have faith in their own government or the United States to protect them. CIVILIAN 1: We have lost confidence in the international coalition. Before the liberation of Hawija began, we dreamed that our areas would be liberated from ISIS. But when we returned from displacement and saw the situation with our own eyes, we were sure that they were not serious about liberation.